Boss CS-2 Compression Sustainer Made in Japan with black label. Made in Sept 1986 based on the serial in the battery compartment. Awesome pedal and works great. I'd love to keep it, but I already have a decent enough compressor and would rather use these funds for another pedal. Condition is Used. Shipped with USPS Priority Mail. If you do not have an ACA adapter or you do not want to use the battery. BOSS Pedal Board BCB-60. BOSS Line Selector LS-2. BOSS Noise Suppressor NS-2. BOSS Chromatic Tuner TU-2. BOSS Chromatic Tuner TU-3. Boss CS-3 Compressor Pedal DIY Modification Upgrade Kit. ( This is a kit to modify your own pedal -PEDAL NOT INCLUDED). By replacing certain components you make your pedal sound/react differently. Therefore the best thing to do is to learn how to modify your existing pedals and that's when you'll achieve a blow-your-head-off GREAT SOUND. 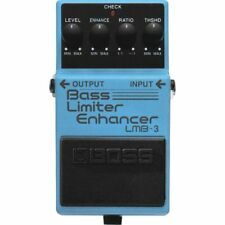 Product: LMB-3 Bass Limiter Enhancer. Bland: Boss. C :Although the condition is bad. No problem with sound output. Item status: Used. S :A state close to unused. I also exhibit various effects pedals in addition. (You receive a boss pedal guide bush (O-ring rubber) for free.). Even if you think to yourself, "But the item I want is only available in Japan.". Previously owned Boss CS-2 Compression Sustainer Guitar Effect Pedal. All functions are working. Grade: Excellent condition! With a few slight marks/scars and rubs from normal use. You need to use the adapter compatible with the device or it might affect the sound quality. (You receive a boss pedal guide bush (O-ring rubber) for free.). Even if you think to yourself, "But the item I want is only available in Japan.". All our pedals have been cleaned and sterilized including back plate. BOSS RGE-10 Graphic Equalizer Half Rack. Excellent . manuals can be download from the manufacturer website. Knob: LEVEL, ATTACK, MODE. perfect working. There are fine scratches, glare and dirt, but it is a second-hand goods of a state with only a little feeling of use. Serial　number: 9500. Accessory: None. I will look it for you. It is totally in good condition. Including No Accessory. Appearance of the item. Functional It works properly. It can adjust picking forth widely and provides any drive sounds. Tone House Studios has new Guitar and Recording Studio gear being added every week! Many issues can be solved quickly and efficiently with quick correspondence. Boss CS-2 Compression Sustainer Effects Pedal. Equally good for Guitar or Bass, from 1981 to 1989, the Boss CS-2 Compression Sustainer was one of the few go-to compressor options. A classic Boss pedal and still rated as the best Compressor they have produced. This is the first Compression/Sustainer pedal released from Boss. Like all compression pedals it reduces the output of sounds over a set threshold relative to the strength of the input signal, making levels consistent and improving sustain. Suitable for guitarists and bassists, the Boss CS-3 compression sustainer pedal is designed to produce tones with compression effects from your guitar. This Boss guitar pedal gives you a smooth sustain music without affecting the quality of the sound. ; Made in JAPAN. I apologize for any inconvenience this may cause. Not perfect but showing signs of use. Tested and working. 2 screws missing from bottom plate. Typical scratches and worn spots. We have tested all switches, knobs, in / output works fine. No AC adapter included. Boss Pro CL-50 Compressor / Limiter. - 80's Japan Half Rack Effects. This item does not include AC adapter. we have tested with 100V Japan adapter which is not for 120~240V worldwide area. Boss CS-3 Mod Service! Send us your pedal! (1) We will be performing our mod service on your Boss CS-3. About the Mod If you want the modified pedal, check out item number: 221592508419. And I can't emphasize this enough. USE YOUR HEADPHONES! Enhancer also tunes the way of effect and the band more based. Good character and good sound effects are outstanding in bright characters. There is the possibility of rust, fading, scratches, cracks, dents, etc. Pedal Type Title: BOSS CP-1X Compressor. Accessories: 1 FREE PICK It can not be chosen. Power Source Manufacturer Part Number. This pedal is in great condition and works perfectly. There is velcro/adhesive on the bottom of the pedal so it's ready to go on your board. Make Model: BOSS CS-1 JAPAN. We update our information daily, but there is still a chance this may occur. EMS is safe, fast (approx. Ishibashi Music Corporation. ). Serial# 7900, which points to this pedal being produced in February 1979. The only issue is that when a chord is played it seems to warble a bit on the sustain. This is how Boss produced their early stompboxes. Consumo: 11mA. n°: 409939. Peso: 400g. Respeta los detalles dinámicos del guitarrista expresivo. Boss MDP-Technologie. - Professionelle 18-Volt-Eingangselektronik für einen außergewöhnlichen Headroom und einen klaren, druckvollen Klang. - Für den Einsatz mit sämtlichen Gitarrentypen, inklusive 7- und 8-Saiter- sowie elektroakustischen Gitarren. PERMUTIAMO IL TUO USATO ANCHE A DISTANZA! Già velcrato.